Tatra is one of the oldest automobile manufacturers in the world. They stopped making cars in 1999 and now concentrate solely on trucks, most of which are huge and solid-looking. The Tatra T52 was an upmarket version of the T54 (and later, the T75). While later Tatras are known for being rear-engined and air-cooled, this car is front-engined (and rear-wheel drive). But it still has an air-cooled engine (if you’ve looked at a lot of air-cooled cars, you’ll notice they lack a traditional grille in front of the engine, as this car does). It is powered by a 1.9-liter flat-four making about 29 horsepower. The body is a rare limousine body. Most Tatras are among the coolest-looking cars on the planet and this is among the coolest designs they had (the less traditional the better). The body is all original. The engine has been gone through recently as well as the clutch, brakes and axle. Basically, the mechanicals have been sorted, making this a driver with one hell of a cool, old body. Only about 950 T52s were built. This is one of very few cars in this sale without an estimate (what are they going to compare it to?). Click here for more info and here for more from Coys Techno Classica sale. 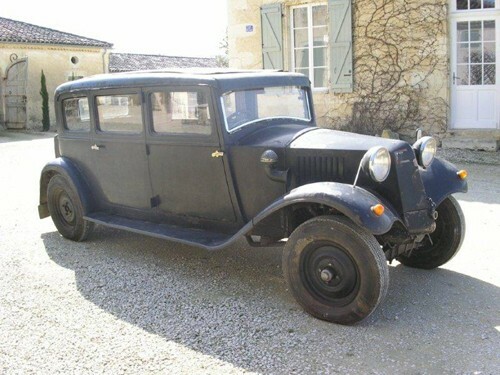 This entry was posted in Uncategorized and tagged 1934, auctions, cars, classic cars, coys, limousine, t52, tatra by classiccarweekly. Bookmark the permalink.